There has always been something reassuringly bleak about Borth. A treeless ribbon of buildings along either side of a road built along the storm beach. Some of the cuter buildings are one storey cottages, fashioned out of rounded beach boulders and roofed in slate, homes of long departed fishermen and mariners. Then there is the surge of late nineteenth and early 20th century buildings, more suburban in style, detached and terraced houses of two or even three storeys dwarfing the original inhabitants of the bar. These houses all face inwards onto the road, but the seaward rears of those on the western side are were always battened down come autumn with variously makeshift shutters and boarding designed to keep out the winter storms. For winter storms regularly lash Borth, bursting over the seaward houses and showering beach pebbles through the gaps onto the road. 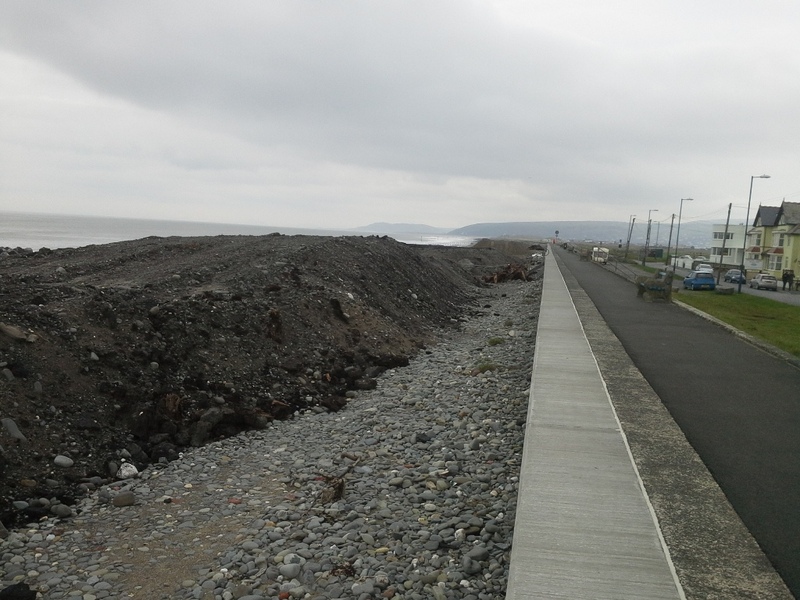 And that is why Borth has recently been undergoing drastic alterations, new sea defences involving great berms of boulders out in the sea, and a huge unsightly reshaping of the foreshore adjoining the southern part of the village. On summer days a decade ago one could walk through a gap between the houses and immediately emerge onto a natural strand of big rounded beach stones, then descend to a truly wonderful vast sandy beach, punctuated by aging wooden groynes, and lapped by an endless sequence of lazy small rollers lapping on the shore. We would buy pizzas and eat them on the stones on a summer evening, and then go in for a last dip swimming and bodyboarding before heading home. 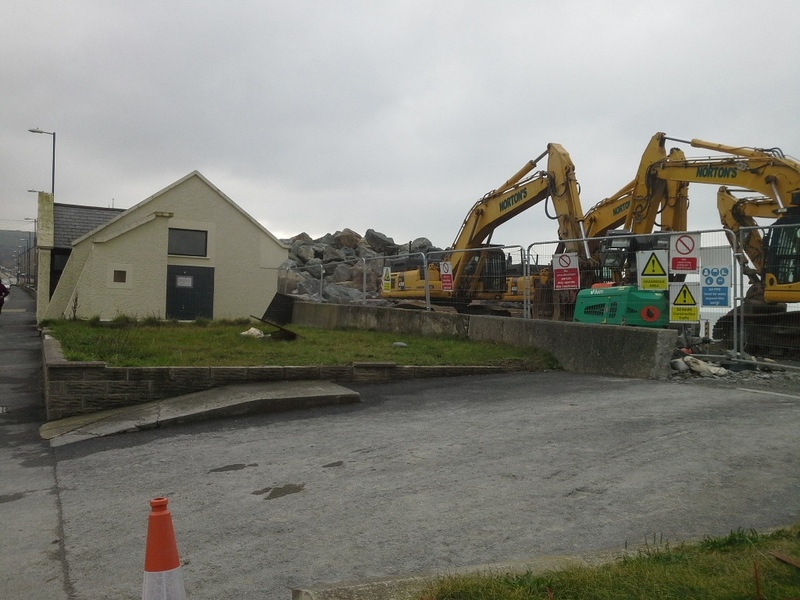 But last week it was not a day for swimming, and the second phase of the new sea defences was well under way. Huge yellow diggers on caterpilllar tracks articulated their giant scoops in the shore and Volvo dumper lorries roared back and forth along the once pristine sands. The groins were being plucked out by another machine, like toothpicks from the sand. A pile of stones destined for another berm reared high as houses, dwarfing the municipal loo nearby. The shore was entirely churned and dominated by the machines, digging out the peat and clay below the intertidal zone and transporting the excess material up to big waste piles by the promenade. Diggers parked by the Public Conveniences on Borth sea front. A huge stone pile awaits its final location on the lower shore. 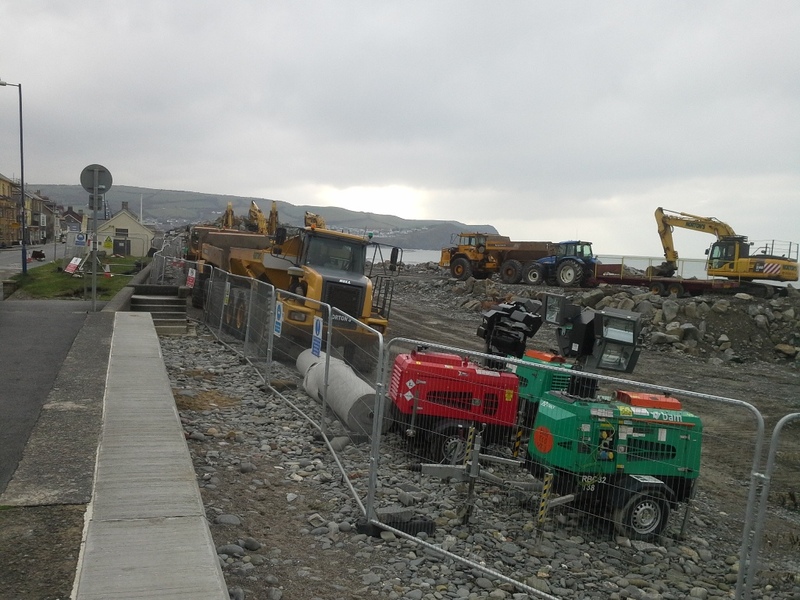 Diggers and dumper lorries at Borth. Clay and peat dug out from the lower shore at Borth. I returned on the Sunday, when the site was quiet. Inside the security fencing on the upper shore were caches of materials and site waste: excavated clay and peat, old Victorian pilings with armoured metal points, and quarried boulders trucked in from Pembrokeshire. But there was another category of waste : piles of tree stumps, their roots frayed and yellow where they have been torn from the ground, their bark still scaly and intact though waterlogged. 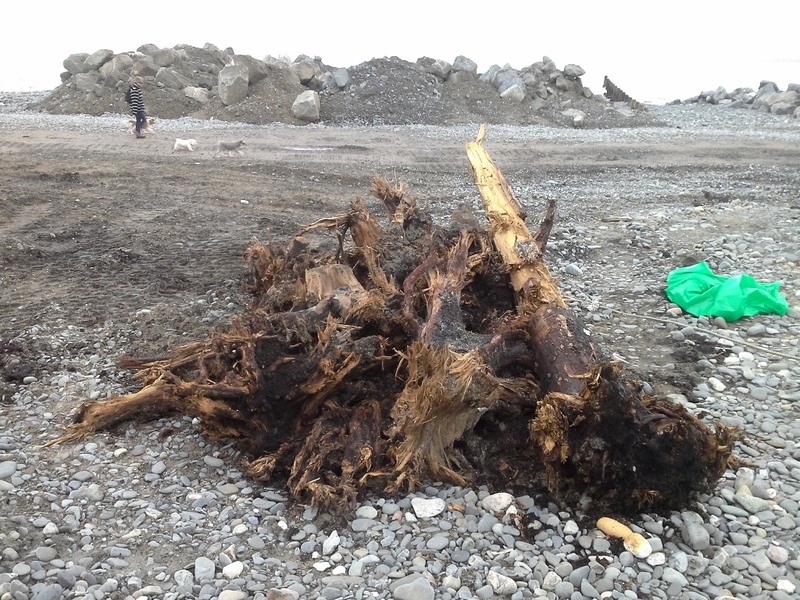 Ancient tree stumps from the submerged forest, dug out during the storm defence work at Borth. 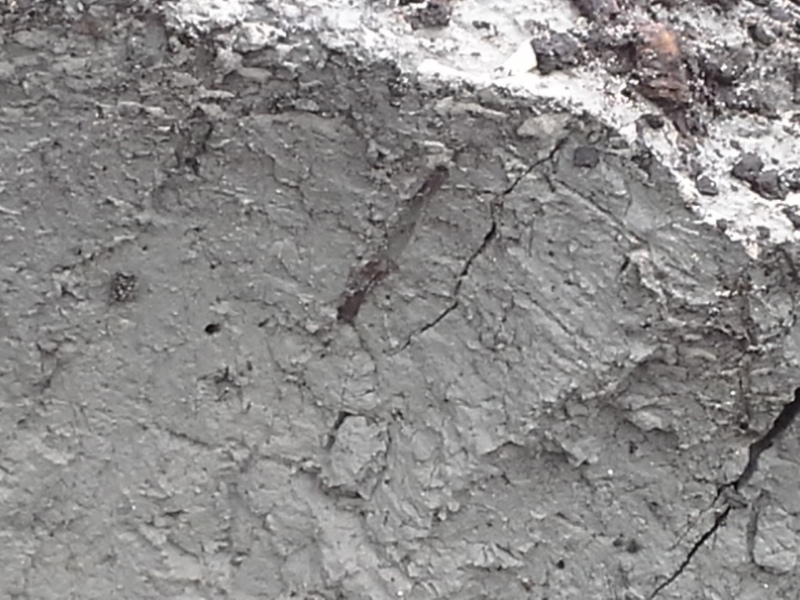 Lumps of excavated clay laced with roots descending from what was once the surface of the forest floor. The trees have come out of the grey clay in the intertidal zone, and are 6000-10000 years old remnants like the more familiar ‘fossil forest’ which gets exposed at low tide on this beach when the sands shift. They look much fresher that those, perhaps because they have been entombed in sediment rather than smoothed and battered by the waves. The giant diggers unearthed them when preparing platforms for the new berms on the lower shore. They are piled up in tangled heaps now, each with a survey label attached, and destined to go off to Lampeter University for carbon dating and other tests. The old legend of Cantre’r Gwaelod has never seemed more convincing. 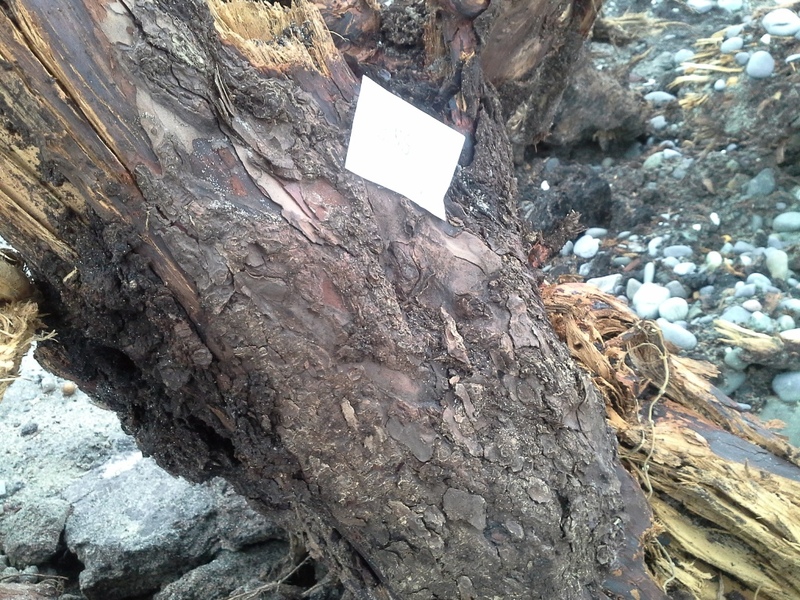 Judging by the scaley bark, many of these trees appear to have been pine trees, which formed a forest west of Borth when sea levels were lower. And they all look much of an age, and as if some catastrophe resulted in their preservation. This ancient tree looks like a pine, which formerly grew west of Borth village. Was it really a gradual rise of sea level which killed them? If so, would they not have died standing, and rotted and weathered over the years? Or was there a sudden breach of a shingle bar which formerly marked the coastal margin further out to the west, and swiftly brought about their burial in sediment? If that is the case it’s not a far cry from the old legend of the drunk Welsh prince Seithenyn, who one night forgot to close the sluice gates to the kingdom as the tide rose.